We are well and truly shook. If you're anything like us, you've been a fan of Dove Cameron for a while. She's a mainstay on the Disney Channel, starring in Liv and Maddie, and recently reprising her role as Mal in Descendants 2. While she certainly shines on the network, there may be some clues that Dove is ready to explore greener pastures outside the family friendly network. One way to know a person's innermost thoughts is to check their Twitter likes. It's entry level sleuthing 101. As J-14 noted, a quick look at Dove's Twitter likes may indicate that she agrees with the chatter surrounding her future on the network. Dove is 21-years-old, which means that her desire to take more adult roles may be growing. One fan tweeted that they would really like to see Dove focus on movies and music in the near future and Dove liked the thread. 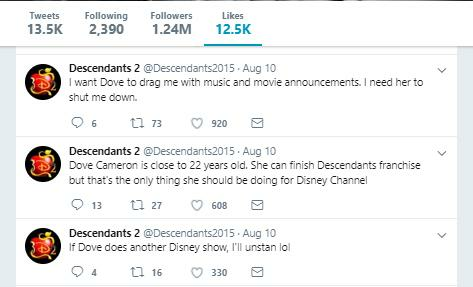 Now, this doesn't mean that Dove is going to sever her ties with the Disney Channel tomorrow. However, it may be an indication that Dove is ready to impress fans with more grown up roles and projects. 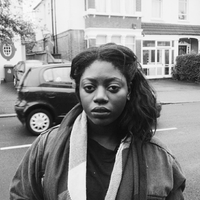 She is perfectly placed to make a seamless transition into mainstream music and films. With her skill and huge social following, we're almost 100% sure Dove is going to land quite comfortably at a place like the CW, Freeform, or on a Ryan Murphy vehicle very soon. She has already received rave reviews for her performances in NBC's Hairspray Live! and Mamma Mia at the Hollywood Bowl. Of course, Dove would follow in the footsteps of Disney alum like Selena Gomez and Bella Thorne, who have managed to parlay Disney success into full fledged acting careers. If the star's Twitter likes are anything to go by, Dove is definitely listening to her fans when they say they're ready to see something new and grown up from her.